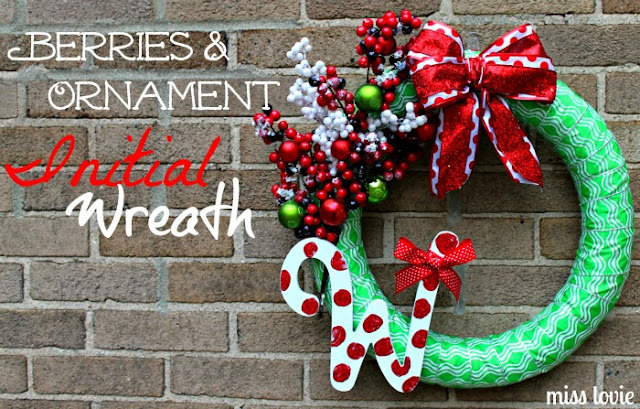 I got excited when I was asked to create this wreath for a work friend because I knew I'd get to do something fun. 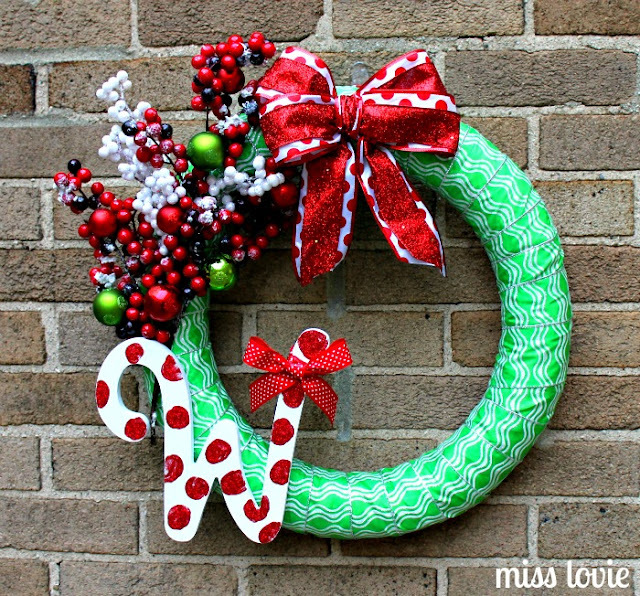 I love the traditional Christmas colors, but I wanted this wreath to be extra bright and cheery since it was going on a first grade teacher's door. 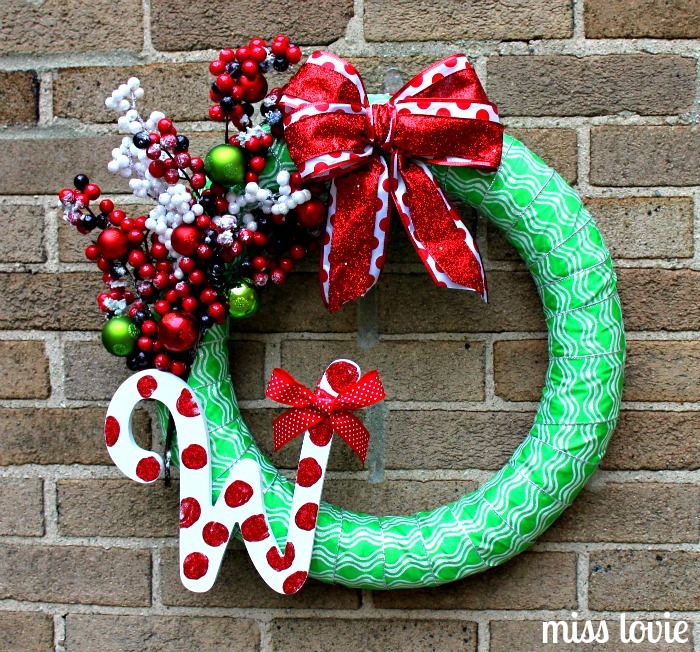 :) The lime-ish green ribbon I used to wrap the wreath did just the trick-and the polka dots of course. When it comes to decorating classrooms, polka-dots are always my go-to move. Ha. I was originally going to do a picture tutorial, but this wreath was so easy, I didn't take step by step pictures. You can do it. Wide ribbon for the wreath(50% off at Michael's! )-mine was wired, but it doesn't need to be. More wide ribbon for the bow. Wrap your wreath with the wide ribbon, adding hot glue every now and then as you go. Trim your sprigs some, mix and match, do whatever you like. Find a place where you think it looks right and hot glue it on. Hold it down for several seconds to insure it sticks since the sprigs will most likely be kinda heavy. Glue on some ornaments to fancy up the sprigs. Paint large dots of glue dots on your initial. (Mine came white-from Michael's-, but you may need to paint yours if yours did not.) Sprinkle glitter over the glue dots and let dry. 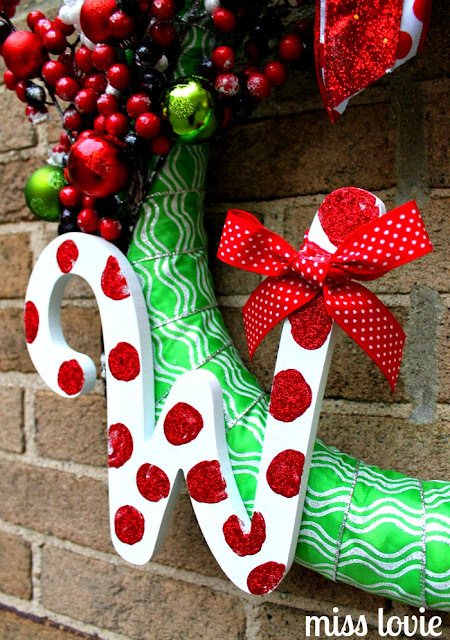 Once dry, tie a sweet little ribbon bow to your initial if you like! 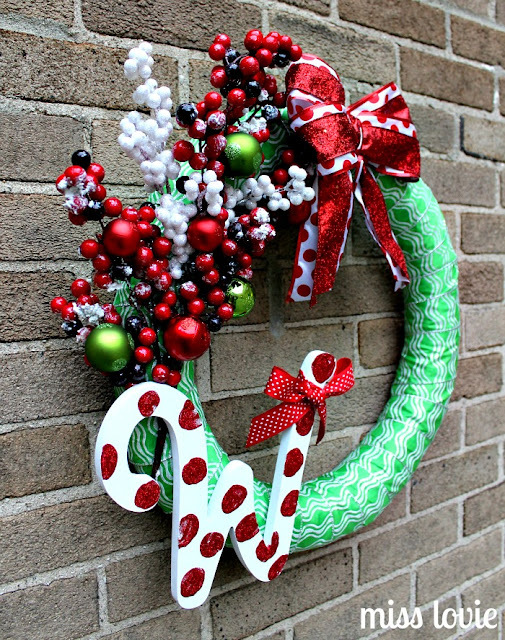 Glue the initial to the wreath over the bottom of the sprig. Make sure everything looks right and level. Hot glue a fun ribbon on top and you're done! 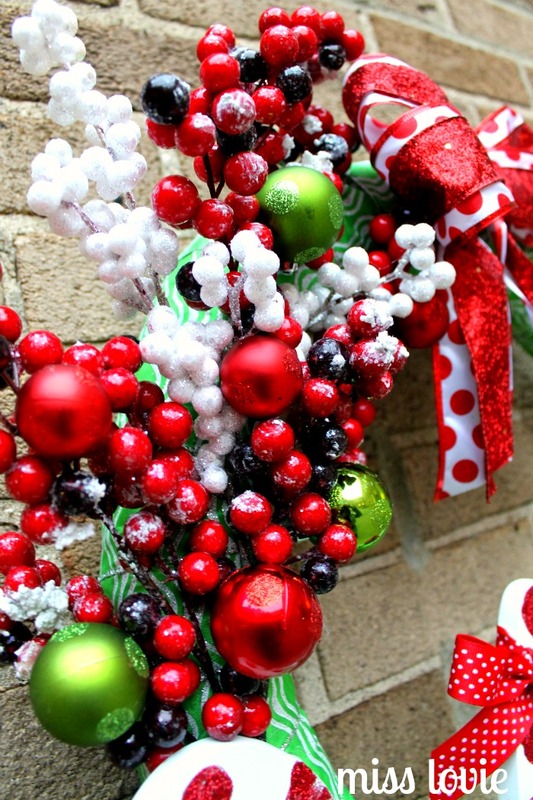 You can glue a knotted ribbon loop to the back of the wreath to use for hanging if you like. 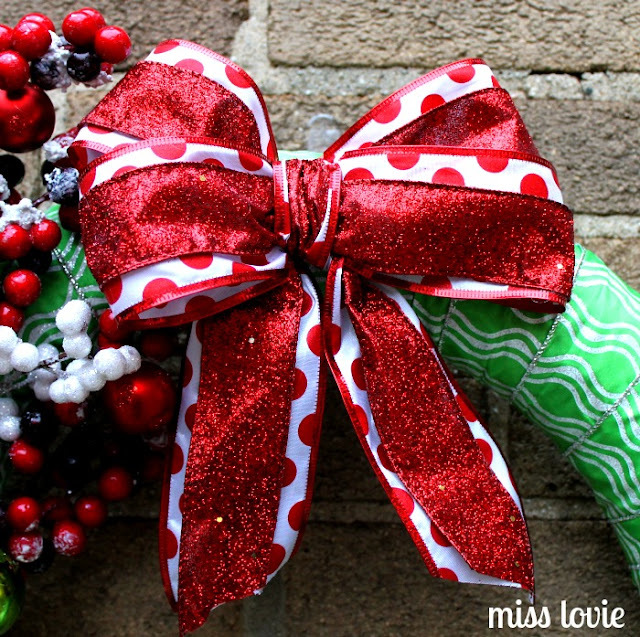 Hope you love this simple, but bright and happy idea for a Christmas wreath! Sharing via the parties on my sidebar. Hello! I feel like it's been forever since I've posted. Probably because it has. I'm sorry. I've had lots of school things going on and I've just been exhausted after school. It's just that time of year where I get really tired after work and just want to sit on the couch and do nothing. So I'm sorry. 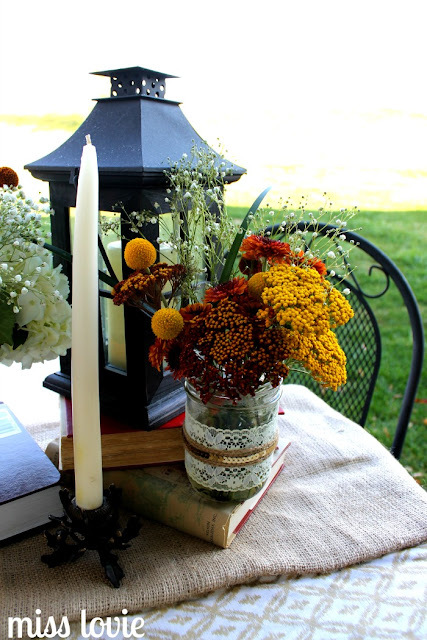 I have lots of ideas that did not get done for fall decorating and sewing. Hopefully Christmas will not be the same. My goal is to start scheduling in "creating time" so I will actually put my ideas and plans into action. Let's hope it works. I'm planning a wreath today. So get excited. Kroger had big bunches of fall flowers for $1.99 a couple days before Thanksgiving so I decided to make some flower arrangements. 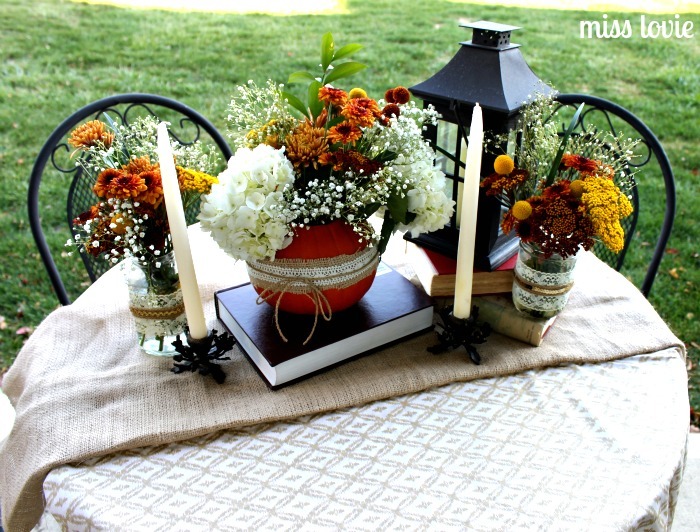 I've been dying to try the carved out pumpkin with a vase inside idea. I just love these colors. I am always sad to see them go when we pull out the Christmas decorations. I love decorating for Christmas, but pumpkins and gourds might still be my favorite. 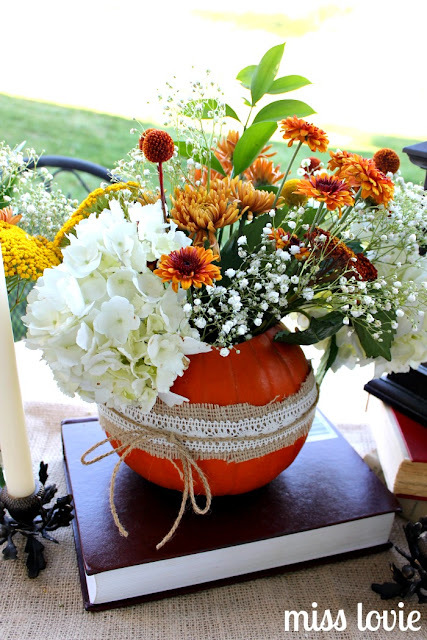 To make the pumpkin vase extra special, I simply added some lace trim on top of a strip of burlap and tied some twine around it in a simple bow. I secured it all with a few dots of hot glue. I did the same with the jar I was using. I used this vintage wide lace trim I had and glued it on first. Then I wrapped the twine around the middle several times and then glued some gold sequin trim to the middle. 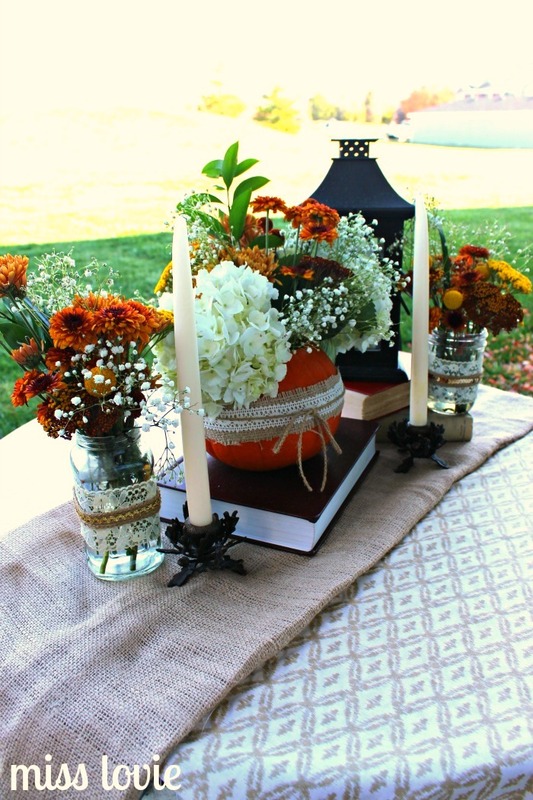 I just love decorated jars like this. 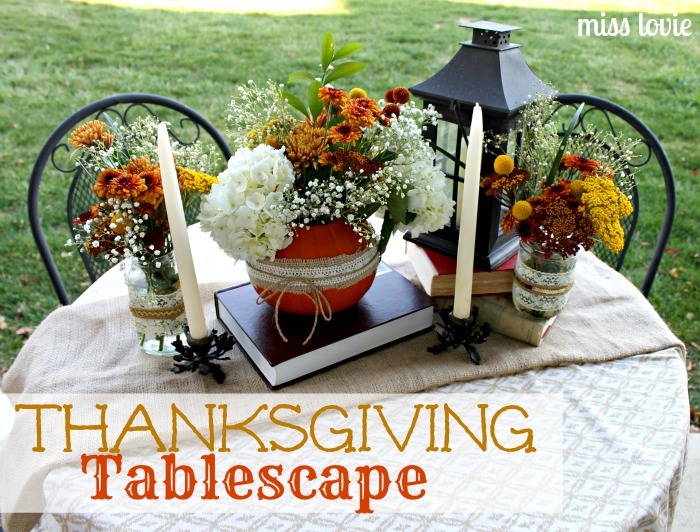 I know no one needs a Thanksgiving or Fall tablescape now that the Christmas season is fully upon us, but I thought I'd share anyway. It was just too pretty. Have a wonderful day! 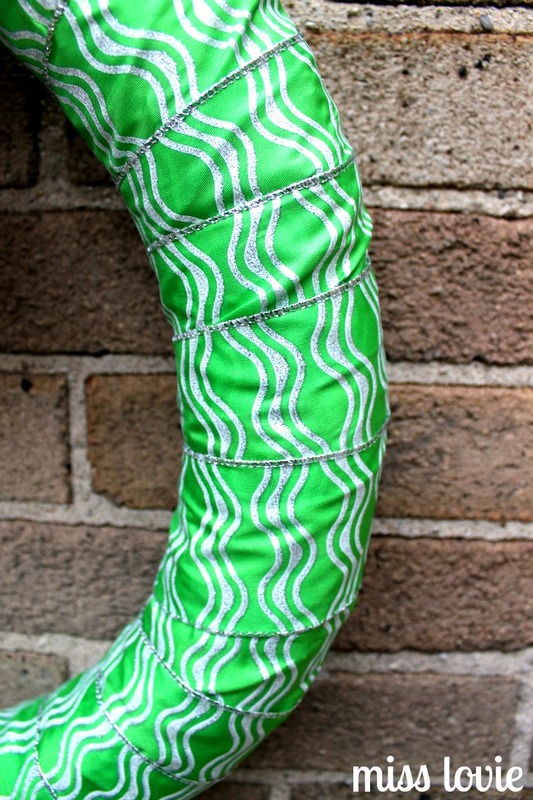 I am over at According to Kelly guest posting today for the Holiday-Inspired Bake Craft Sew Along. Be sure to go check it out! Also, I get to help start the holiday season off with a bang, and treat you to an absolutely amazing giveaway as part of our crafty series. Silhouette Portrait: this is Silhouette's newest electronic cutting tool for personal use. Like a home printer, it plugs into your PC or Mac® with a simple USB cable. However, instead of printing it uses a small blade to cut paper, cardstock, vinyl, fabric and more up to 8" wide and 10 feet long. The machine also has the ability to register and cut printed materials. DecoArt Glass Paints & Stencils: non-toxic and enviromently-friendly, DecoArt has one of the widest selection of paints and finishes for arts, crafts, and home decorating, which includes over 25 brands of paint and finishes. Simply wait for RaffleCopter to load and enter there! Be sure to check out all the fabulous craft projects shared this month for this Holiday-Inspired Bake Craft Sew series going on all month long. 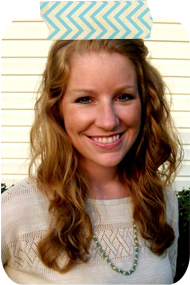 & Don't forget head on over to Skip to my Lou & A Southern Fairytale for more chances to win! 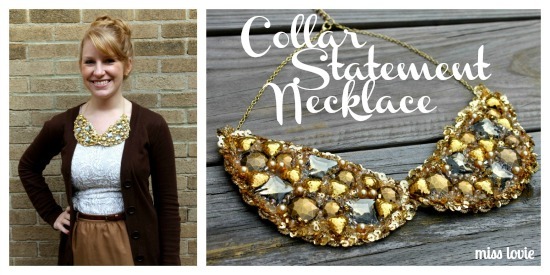 You've gotta go check out my newest jewelry tutorial over at Thirty Handmade Days, the Collar Statement Necklace. 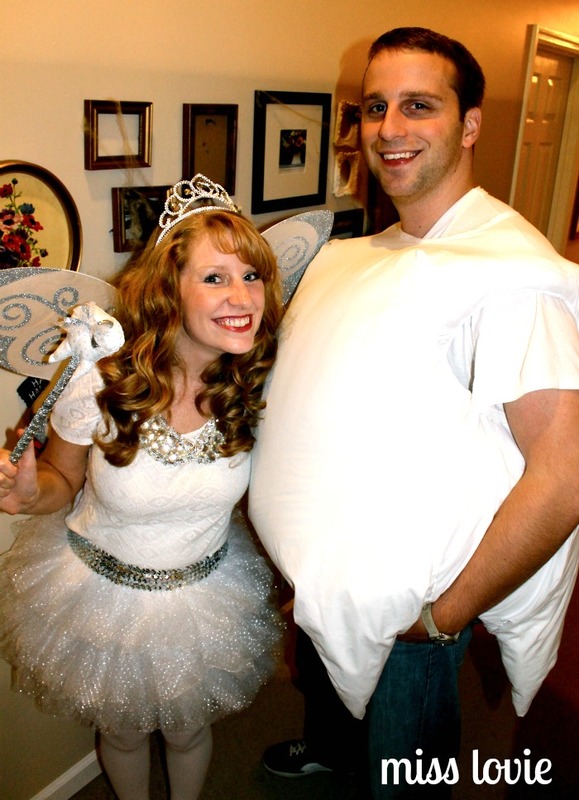 Remember the necklace I wore for my tooth fairy costume? 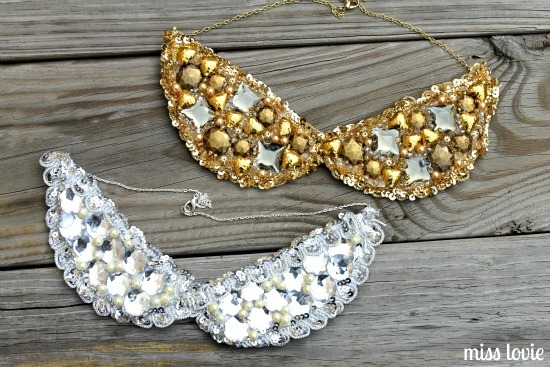 The Collar Statement Necklace is the tutorial on how to make it. And I made one in gold this time!